Warfare Incorporated :: View topic - Close the Clan? Posted: Mon Nov 11, 2013 2:50 pm Post subject: Close the Clan? The clan is exactly 1 year and 5 months old. It's gown inactive and a lot of the members on the 'active' list are kinda inactive. The game and community are growing inactive. Clans in general have gone inactive too. I don't see any clans I would call 'active'. I don't foresee many of the current clan members becoming active again nor do I foresee many new players joining. Because of this, I would like to ask you guys (the clan members), should we shut down the clan? You can reply by posing on this topic or by PMing me. Shutting down the clan would mean the clan forum being hidden and The Roman Scorpions being classified as a "clan of the past". 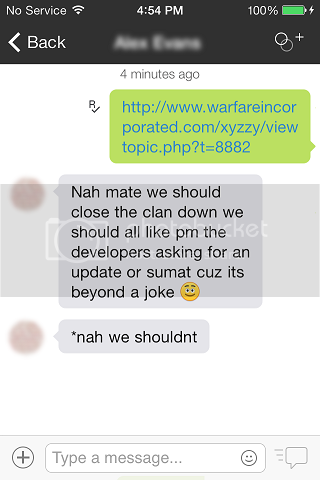 If, by 12pm EST on 11-16-13 (about 5 days from the time of this post), the majority of the clan members vote to shut the clan down, it will be shut down. If, by 12pm EST on 11-16-13, the majority of the clan members vote not to shut down the clan, we will hold a vote for a new clan leader and moderator. Below is a picture of bid winner's vote. It has been slightly edited to blur bid winner's name and picture due to privacy. Since he doesn't use the WI forums much his vote is being posted as an image (with his permission). Keep the clans sitting like all the other clans. Why should we close down if all the other clans are still up even tho they aren't very active? Why should we close down if all the other clans are still up even tho they aren't very active? Two reasons come to mind. First, since we are inactive in the game (we as a clan -- personally I'm not inactive and there's another fairly active member), unless we intend to bring the clan back at some point in the future, there's not much use keeping it 'running' if it's inactive and we have no intentions to change that. Second, I'm soon going to step down from my position as clan leader, so if it is to stay running, it's going to need another leader and moderator (can be but doesn't have to be the same player) that is active. Voting period is over. Thus, this topic needs no further discussion and is locked.